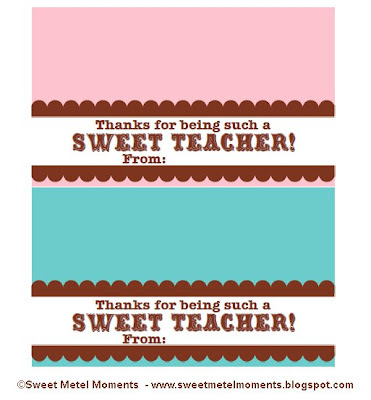 Sweet Metel Moments: Free Printable - Teacher Appreciation Gift - "Sweet Teacher"
Free Printable - Teacher Appreciation Gift - "Sweet Teacher"
Teacher Appreciation Week starts on Monday, May 7th. Brody and I are excited to show all of his teachers how much we appreciate them for all of their hard work and dedication! For the first day, we wanted to start the week with something "sweet" and simple. Especially since Brody will have PE on Monday, and with 4 PE teachers, in addition to his 2 kindergarten teachers, we needed to keep the gift affordable. Who doesn't love chocolate? We filled 6 snack sized bags with various Hershey chocolates and topped them with a personalized label that says, "Thanks for being such a sweet teacher! From: Brody". Once the labels are printed, cut them out and have your child write his/her name on them. Fill some snack or sandwich bags with chocolates (or anything sweet like other candies, cookies, brownies and other baked goods), fold the labels in half and staple them onto the bags, and you have some "sweet" gifts to give to your "sweet" teachers! Thank you so much for the adorable printable. I can't wait to give my son's teachers something sweet for Mother's Day.